I have lost 1st 9lbs23lbs10.4kg and it took approximately 6 months. Clothes no longer fitted, so I was buying two sizes bigger. Also I'm a runner and Zumba fanatic and the extra weight was slowing me down - I felt heavy and unfit. I ran a half marathon and felt every mile. I also came back from a holiday where I had been conscious of my increasing tummy and thighs. I decided to lose the weight and was looking for a calorie controlled eating plan. I found Nutracheck on the Play Store on my phone. Looking back over the years (before you lost weight with NC) how would you describe your relationship with food? I had tried other diets in the past and while they worked initially, I found them restrictive at times. My weight has gone up and down over the years. 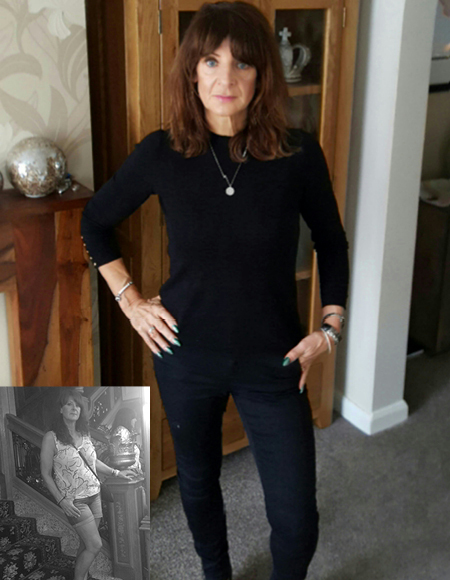 I stopped smoking and hit the menopause, going up to 14 stone196lbs88.9kg. I managed to lose that over a few years but became complacent and let things slide. Now I feel fantastic... I ran a PB in a 10k in October. With Nutracheck I could eat good, healthy nourishing food and have the occasional treat without feeling the need to binge or overeat. At first I found the portion control quite difficult - I was eating until I felt over full and bloated but I soon got used to it and I'm now satisfied with smaller portions. How do you feel now compared to before and do you have any notable milestones to report? Now I feel fantastic, Healthy and active and my running has improved. I ran a PB in a 10k in October and I'm running my third half marathon in April 2017. My tips to anyone wanting to lose weight are to take it slowly so the weight stays off, make healthy food choices and take exercise.